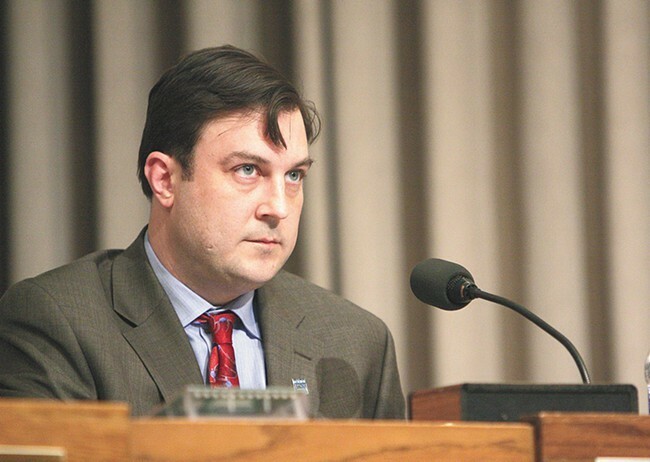 Spokane City Attorney Nancy Isserlis has recommended that the city's Ethics Committee look into a possible ethics violation by City Council President Ben Stuckart. In a letter to the chair of the committee, Isserlis says Stuckart "received a highly confidential email regarding a pending matter in litigation, clearly marked 'attorney client privileged' and forwarded the email to the opposing party at his personal email address." Specifically, she says Stuckart and other councilmembers received an email from Assistant City Attorney Erin Jacobson about the course of legal action the city would take after losing a court case in which the local fire union challenged the city's reorganization of the fire department and expansion of positions exempt from civil service, and then Stuckart forwarded that email to Don Waller, president of the union, Local 29. "Within twenty minutes of receipt of Ms. Jacobson's email, Council President Stuckart forwarded the email, in its entirety, to Mr. Waller at his personal email address," Isserlis writes. "I believe Mr. Stuckart was aware he was forwarding confidential information to the party opposing the City in pending litigation." Isserlis cites the city's ethics code, which prohibits disclosure of "any confidential, privileged or proprietary information," and state law saying "No municipal officer may disclose confidential information." And, she says, disclosing such confidential information violates attorney-client privilege between city legal and the council, which can't be done without a full council vote. The email is included in Isserlis' referral, but the entirety of the message is redacted, so its unclear what exactly it included, but Stuckart tells the Inlander it was nothing that wasn't already "common knowledge in the press or wasn’t already argued in the court case." Isserlis said she found the email "inadvertently" while she was investigating a complaint from Waller about a budget transfer that was used to pay for a new position in the fire department. In a statement sent to media this morning, Stuckart says he "did forward that email, and I should not have done that. For this I apologize." But he adds that he doesn't believe the action was a violation of the city's ethics code because the content of the email didn't harm the city. "There was no harm to the City, and any potential harm was de minimis and inconsequential in nature," Stuckart wrote, continuing later, "The City of Spokane lost the firefighters appeal not because I forwarded an email, but because of the clear erosion of our civil service caused by the creation of a fire division with multiple departments. I stated that this was an illegal action in my public testimony in 2013 and the courts agreed with me." Stuckart has hired a private attorney and tells the Inlander he's reached out to the chair of the Ethics Committee to ask what his next step should be since he believes Isserlis' referral is not the same as a formal complaint. When formal complaints are filed, the person involved is asked to file a response with the committee. He also brings up an old issue: The city's negotiations last year with the police guild over its latest contract and how much civilian oversight that would include. Back then, we reported that Councilman Steve Salvatori (who has since resigned and moved to Texas for work reasons) sent portions of a tentative agreement with the guild to the nonprofit Center for Justice. Stuckart says he wonders why no ethics concerns were brought against Salvatori then, though he won't speculate why. Isserlis could not immediately be reached for comment on that. Through City Spokesman Brian Coddington, Isserlis declined to comment further on the referral or on Salvatori’s actions. "I'm not going to draw any conclusions, but in the time I've been in office, a situation very similar to this happened and nothing was done then," Stuckart says. "What’s different now?" Read Isserlis' full referral here and Stuckart's response here. The Inlander's first-ever political TV ad awards!